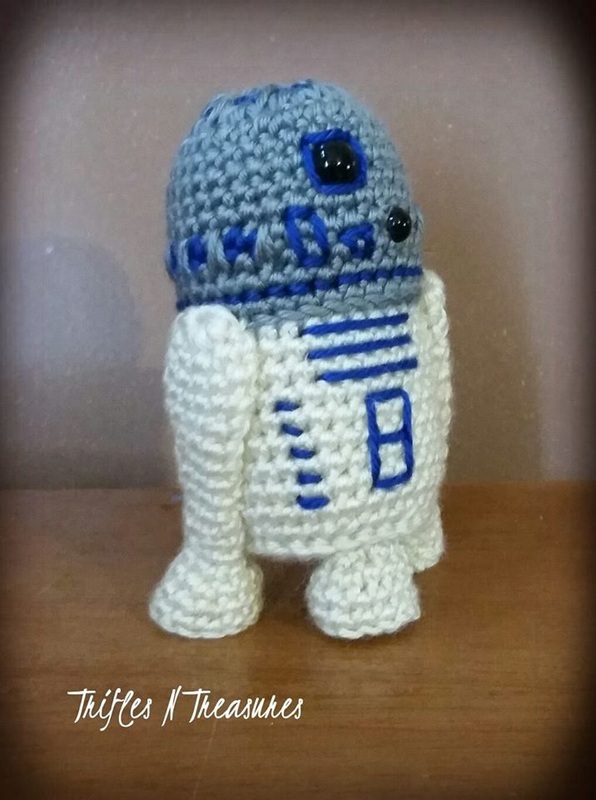 ​Here are the free crochet instructions to make your own adorable tall droid! Finished model measures 6” tall x 3.5” wide. Rnd 1: With Gray, ch 2. Work 8 sc in 2nd ch from hook. Join. (8 sts) Drop Gray. Join Blue. Rnd 2: Ch 1. Work 2 sc in each st around. Join. (16 sts) Drop Blue. Pick up Gray. Rnd 9: ch 1. Sc in each of the next 12 sts. Drop Blue, pick up Gray (carry Blue through these sts) Sc in each of the next 8 sts. Drop Gray, pick up Blue (carry Gray through remainder of rnd) Sc in each of the next 12 sts. Join. (32 sts) Drop Blue, pick up Gray. Rnds 11-12: ch 1. Sc in each st around. Join. (32 sts) Fasten off Gray. Join Off-White. **Insert safety eyes now. Place the 12mm eye at rnd 6-7, and the 8mm eye at rnd 9-10, with 2-3 sts between them. The 8mm should be 1-2 sts away from the blue on rnd 9. Rnd 25: ch 1. Sc2tog, 8 times. Join. Fasten off, weaving tail through opening to close. Rnds 15-16: ch 1. Sc in each st around. Join. Fasten off. Rnds 4-5: ch 1. Sc in each st around. Join. Fasten off. Using a yarn needle and Off-White yarn, sew legs securely to sides of body, slightly overlapping the Gray section. 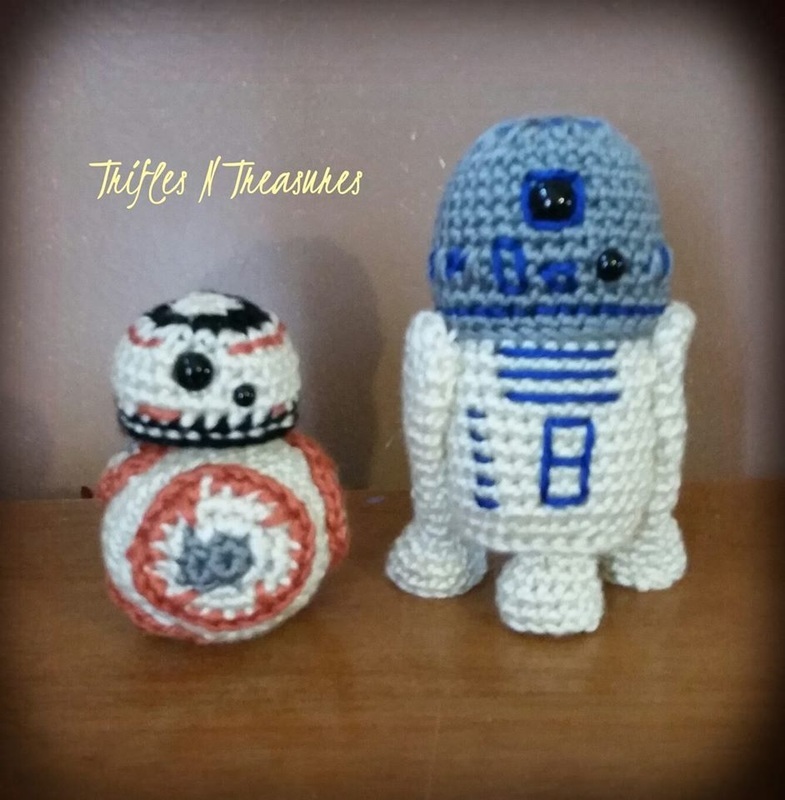 You can stitch them in any position you like~I like the slight backward slant. Stitch foot to front and center of bottom of body. Weave in all ends.